Come and join the Beloit Memorial High School Performing Arts students as they offer an afternoon of "Broadway Bingo." The event starts at 2 p.m. in the banquet room at the north end of LaCasa Grande Restaurant at 618 Fourth Street in Beloit. Admission is $20 at the door and includes one "BINGO" card. Additional cards will be $5 each. Throughout the afternoon, you will be filling in the spots on your cards with clues provided by our MC or from the titles and lyrics of songs and scenes performed by the BMHS students. Hors d'oeuvres are included in the admission price and a cash bar will be available. The event is a fund-raiser for P.A.P.A.S (Parent Advocates for the Performing Arts in Our Schools.) All of the prizes for the BINGO winners will be based on the titles of Broadway musicals. Don't miss out on the fun! - Acoustical panels on the auditorium walls for reflection and absorption of sound. This will provide a more even hearing environment for the audience and eliminate some of the feedback problems that were created when the asbestos was removed from the walls in the 1994 renovation. 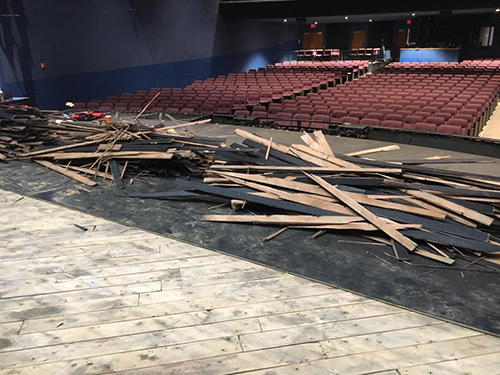 - Replacement of the stage flooring. - Replacement of the stage draperies. - Installation of LED house lights. - Replacement of all the stage lighting to new LED fixtures. - Installation of two electric light bar winches to raise and lower spotlights above the seats. - Installation of air conditioning in the theatre. Click here to read about a $750,000 donation to PAPAS. Were you in band, orchestra, choir or theatre?